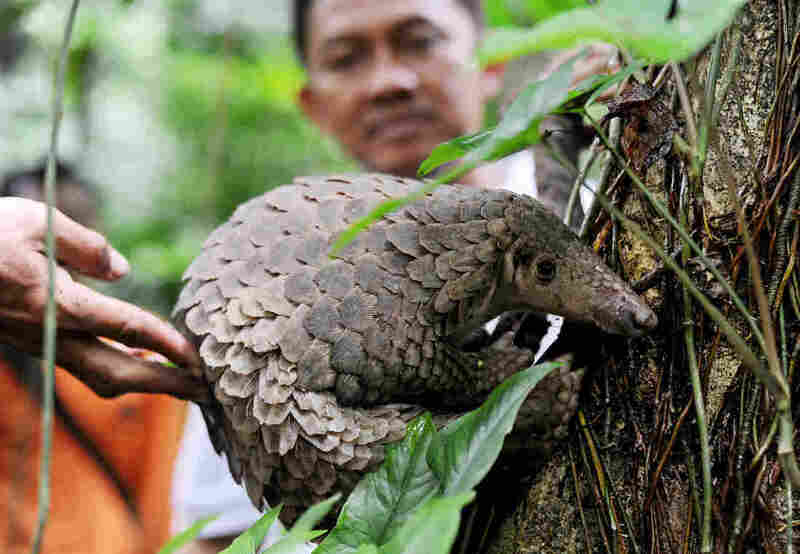 The World's Most Trafficked Mammal Is One You May Never Have Heard Of : Parallels The pangolin, a shy, scaly animal resembling an anteater, is being hunted into extinction, conservationists say. New efforts are underway to protect this exotic creature. A pangolin is released into the wild by officials at a conservation forest in Indonesia in 2013. 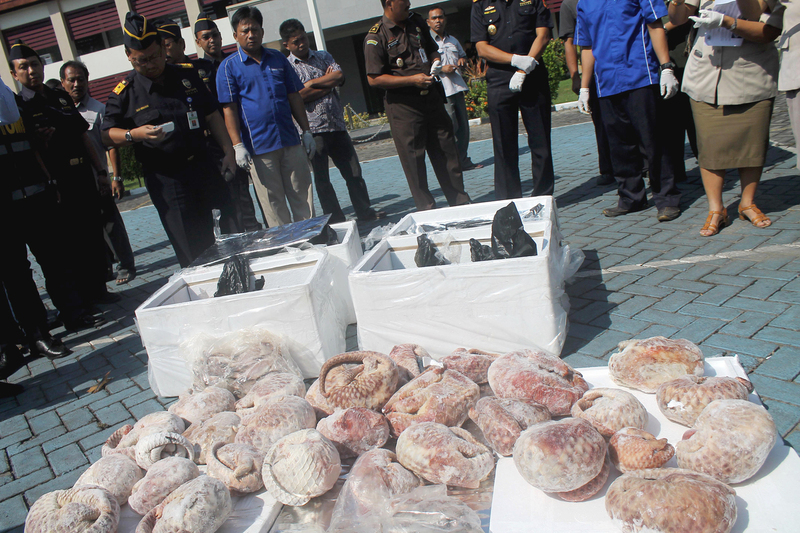 The animal was among 128 pangolins confiscated by customs officers from a smuggler's boat off Sumatra. Lisa Hywood remembers the first time she ever set eyes on a pangolin. It was in 1994, and she had just founded the Tikki Hywood Trust, a wildlife conservation sanctuary in Zimbabwe. One morning, someone dropped off a strange-looking, injured creature that had been confiscated from an illegal trader. "This animal arrived in a sack and smelling something horrendous," she recalls. "And I looked at this animal and I thought it's like no other mammal that I've ever encountered." The pangolin is about the size of a raccoon and looks like an artichoke with legs. Its head and body are covered with an armor of thorny scales, giving it the appearance of a reptile. When a pangolin is scared, it curls up into a tight ball. "I actually, at that moment, felt completely helpless because I had no idea how to take care of that animal," Hywood says. "At that moment, I actually said to myself, 'Right, you need to figure this out.' "
Since then, many pangolins have been brought to Hywood's sanctuary doorstep. The shy, nocturnal creature is the most trafficked mammal in the world, says Jeff Flocken, a regional director with the International Fund for Animal Welfare. Almost a million pangolins were trafficked in the past 10 years. "They are finding literally crates filled with pangolin scales, you know — entire boats with bags and bags of live or frozen and dead pangolins that are being taken from the wild," Flocken says. 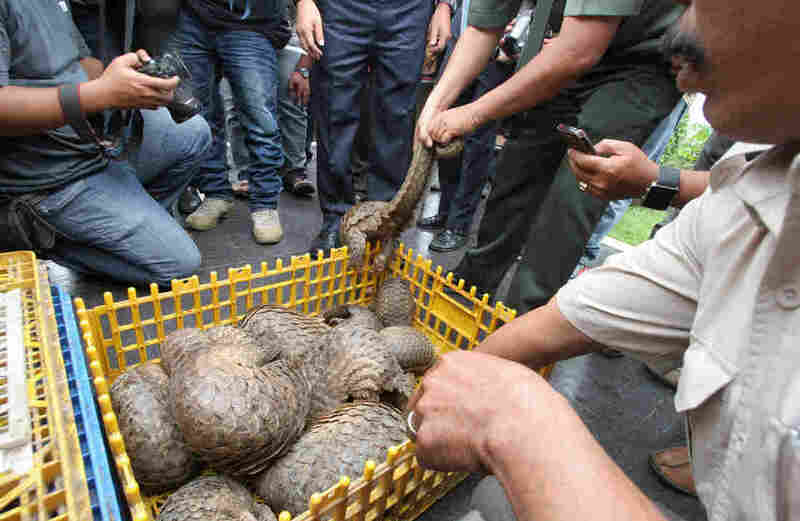 Indonesian officials show live pangolins confiscated from suspected smugglers in 2013. All eight species of this animal, which is found over large parts of Africa and Asia, are facing extinction, according to Jonathan Baillie, a pangolin specialist at the International Union for Conservation of Nature in London. "The demand for the pangolins is actually in China and Vietnam," he says. "And the Asian pangolin, particularly the Chinese pangolin, has basically been wiped out." The animal has long been prized for its scales, which are used in traditional Chinese medicine. But Baillie says nowadays, pangolin meat is considered a luxury item by a growing middle class in Vietnam and China. "We're seeing that the body is actually being eaten as some sort of celebration when a business deal is done," he says. "The price can go up to many hundreds of dollars per kilo." As the number of Asian species declines, Baillie says, there is an increasing demand for African pangolins. International trade of the African species is allowed with the right paperwork. But they're being poached and sent to Asian markets at an alarming rate. Hywood, the Zimbabwe sanctuary director, says the trade has caught many African governments off-guard. "In Africa, you are dealing with a species that most of the authorities, up until, I can honestly say, this year, are not aware of the plight of the pangolin," she says. "They do not understand why the pangolin has such a demand in Asia." Last month, Indonesian customs officials seized more than a ton of frozen pangolins bound for Singapore. The animal is critically endangered, due to high levels of hunting and poaching for its meat and scales. Pangolin products are showing up in the U.S. as well. Part of the problem is the pangolin doesn't have a high profile like the elephant or rhino, so it's easier to slip the live animal or its byproducts past customs officials, says Luke Bond, a criminal intelligence officer with Interpol's environmental crime program. "There's opportunities to conceal these animals," he says. "They're small. Border control agencies are often not trained enough to recognize what they actually might be." Bond says the illegal trafficking in pangolins is linked to other global crimes. "I've seen it firsthand in every operation I've been in for the last 10 years or so," he says. "I've seen drugs and weapons and financial crime activities associated with the wildlife trade." But the sheer speed with which the pangolin is being trafficked is now pushing governments and conservationists into high gear to get the message out that it has to be saved. That's not easy when many people haven't heard of the pangolin, says Rosemarie Gnam of the U.S. Fish and Wildlife Service. The agency is stepping up coverage of pangolins on its website, to include interactive maps and pages for children to discover the mammal. "We're really trying to put the word out there about pangolins, building on the public's awareness of the rhino and elephant," Gnam says. A pangolin will soon be making a debut on an Angry Birds game, and one recently appeared in a Mark Trail comic strip. There's also an effort to list all eight species under the U.S. Endangered Species Act, and another to make it illegal to trade the pangolin under CITES, the multilateral treaty to protect endangered animals. For Hywood, the effort to save the pangolin is paramount. In the two decades since that first scared and injured pangolin was dropped off in a sack, she has created a sanctuary for rehabilitating pangolins. It's one of only a handful in the world. "It's not an animal that you can just collect and put in a cage and feed an artificial diet," she says. "That's not going to work. Pangolins don't adapt very well to captivity at all." At the moment, Hywood is caring for nine pangolins. Each one forages in the wild — with its own security detail to protect it from poachers.